No name is more synonymous with greatness in golf than the name Jack Nicklaus, and no single person has more profoundly changed the face of the sport. He has been named "Golfer of the Century" or "Golfer of the Millennium" by almost every major golf publication in the world, named Individual Male Athlete of the Century by Sports Illustrated, and one of the 10 Greatest Athletes of the Century by ESPN. In 2001, Jack was honored with the first-ever ESPY Lifetime Achievement Award, and he became the first golfer-and only the third athlete to receive the Vince Lombardi Award of Excellence. In November 2005 Jack was honored by President Bush with the Presidential Medal of Freedom, the highest honor given to any civilian, and a few weeks later was unanimously named by Golf World as its Newsmaker of the Year. Jack's competitive career spanned five decades, with 118 professional tournament victories worldwide and a record 18 professional major-championship titles. He is the only player in history to have won each of the game's majors at least three times (six Masters, five PGA Championships, four U.S. Opens, three British Opens), and is the only player to have completed the career "Grand Slam" on both the regular and senior tours. Jack is chairman of the privately held Nicklaus Companies, and Golf Inc. magazine recently ranked him "The Most Powerful Person in Golf" a record-extending fifth consecutive year. As a golf course designer, Jack is considered the worldwide industry leader. He has been involved in the design of 267 courses worldwide, and his firm has created 335 courses open for play in 32 countries and 39 states. At least 60 Nicklaus courses have been ranked in national and international Top-100 lists, and no fewer than 87 have hosted a professional tournament worldwide. 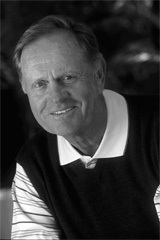 Jack was named Golf World's Architect of the Year in 1993, and in 1999, Golf Digest named him the world's leading active designer. And during a single month in the spring of 2008, Jack received three Lifetime Achievement Awards on three different continents, for his impact on the game and design expertise. Residing in North Palm Beach, Florida, Jack and his wife Barbara have a long history of involvement in numerous charitable activities, from junior golf to children's hospitals to several scholarship foundations. They have five children and 21 grandchildren.